I have made it no secret that cooking is not my favorite thing in the world to do. Not because I don't like to eat, but because I hate the time it takes to look up great tasting recipes my family will love, trudge to the grocery store to pick up the products and then come home and spend an hour or more slaving away in the kitchen for what my boys will gobble down or toss away in disgust in just minutes. That's why I jumped at the chance to review the Blue Apron subscription meal planning service when it was offered to me. Less time in the kitchen, ingredients delivered right to my door, and no searching for recipes? Sign me up! Blue Apron is a subscription meal planning service that allows you to create delicious chef-designed recipes from your home, but without all of the awful legwork that would normally be involved. They deliver all of the farm-fresh ingredients you need right to your door in the proper proportions. That means you don't have to drag the kids to the grocery store, and you are not wasting a ton of food at the end of the week. You know what I mean, I am not the only one who has ever thrown away the leftover content of the produce drawer or that other half a container of chicken broth. They have a 2-person plan and family plan for meals delivered each week, and there is never an obligation, you can cancel future deliveries or skip a week whenever you like. They are always adding fresh new recipes to their menus each week, and you can even go in and change your menu for the coming week if the pre-selected recipes are not something you think you or your family would like. A few of the Blue Apron recipes I would like to try are the Harissa Lamb and Beef Burgers, Shrimp Banh Mi and the Chile-Rubbed Steaks. Now, if you are like me, you might be worried about the shipping of fresh meat, dairy and vegetables, but everything is shipped in a refrigerated box that can be recycled, so everything stays fresh even if you are not home when your shipment arrives. The produce I received was all fresh and vibrant, and when I say they send you all the ingredients you need, I mean it, right down to the pre-measured butter! For my trial, I selected the Blue Apron Family Plan with two meals delivered for the week for a family of four. Now, we have a family of five, but my youngest is a pretty picky eater, so we made other plans for him on the nights I made the Blue Apron meals. There were lovely detailed recipe sheets with full instructions and photos for each recipe on the back. They basically make it impossible for you to miss a step or mess up. The first meal I cooked was the Pork Chops and Apple Mostarda with Roasted Sweet Potato, Toasted Walnuts. I started by doing the prep-work which consisted of cutting the sweet potatoes, apple, lemon, walnuts and pulling the leaves off the fresh parsley. This took just minutes and I was ready to cook. Per the instructions, I got the sweet potatoes roasting in the oven, and then began preparing the apple mustarada in a skillet, followed by toasting the walnuts in the same skillet. Lastly, I started cooking the pork chops in the skillet. They mentioned a technique of spooning the butter over the meat as it cooked, and I really feel that that added flavor and juiciness to the meat. I loved learning a new technique to try! Finally, I pulled the roasted sweet potatoes out of the oven and tossed them into a salad with the lemon and walnuts, we did not add the blue cheese, as no one in our family really likes it, but I love that it was in a separate package so it could be added for those who did enjoy it. The second meal I created with some help from Blue Apron was the Apple Cider Glazed Chicken with Roasted Potatoes, Brussel Sprouts, Onions and Carrots. Again, I had a few minutes of prep work getting the vegetables chopped up, and then I coated them in some olive oil, salt and pepper per the instructions and put the in the oven to roast. While the vegetables were roasting, I started cooking the chicken and then finished by making a sauce with the Dijon mustard, apple cider vinegar and chestnuts. The aroma from the roasted vegetables was incredible and this meal was an instant favorite with my family. It was so tasty and flavorful, yet so simple to make! 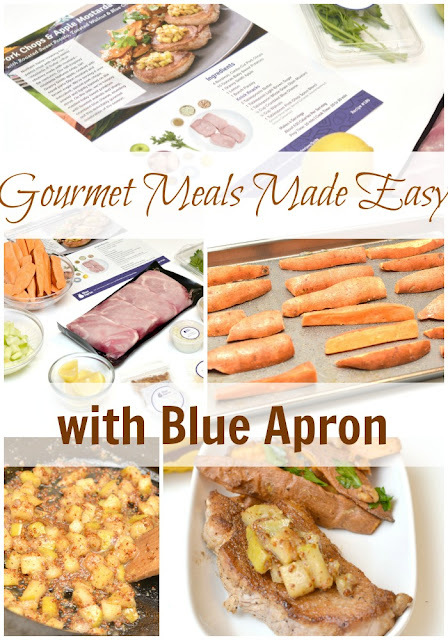 All in all, we were incredibly pleased with the Blue Apron service and our meals. Not only way it convenient, but the recipes were easy to duplicate and so delicious! For the quality of ingredients, level of recipes and the service your receive, Blue Apron is an incredible value for couples and families alike. For a couple, three meals for 2 people delivered each week are only $59.94 and shipping is always free! For a family of four, two meals a week start at just $69.92! Right now, the first 25 Life With 4 Boys readers to sign up can get two meals for free on their first order using this Blue Apron link. This post is brought to you in collaboration with Blue Apron, all opinions are my own.